Jeffrey Bolster’s The Mortal Sea is a history of the 1500-1950s North Atlantic, especially focusing on the American coast and the collapse of its fish populations. Using this long time frame, Bolster’s work makes a case to move away from a schematic presentation of ecosystems’ functioning, which “can all too easily convey the impression of consistency” (17). He advocates for the environmental historian’s ability to draw attention to change over time, observing that “[e]cological interactions are much more complicated than linear cause and effect,” and “[c]harting historical phenomena is often more straightforward than explaining them” (86; 106). However he does not eschew quantitative information and uses it in tandem with other kinds of sources. Thus one of Bolster’s key tasks was to strike a balance between the different types of accounts of reality. Of the many ideas contained in Bolster’s book, one strand particularly piqued my interest. This is the recurring theme that an ideology of humans as stewards of their surroundings has caused the degradation of the North Atlantic ecosystem. Bolster persuades me that humans often see the ocean as timeless. Yet his wealth of evidence shows that profound changes have occurred, and without drawing the false dichotomy between human-caused environmental change and natural fluxes over time, we clearly made an impact. Because the North Atlantic was not previously seen as a subject of historical analysis, its past over the longue duree was obscure; local vernacular knowledge tended to continually shift the idea of what was “normal”. A belief that the environment was provided for humankind’s use exacerbated an attitude of taking, as did the emergence of global capitalism. These converged to create a prolonged emergency. For these reasons Western/European-style fishing practices emphasized maximizing short-term profit, not long-term sustainability (let alone oceanic biodiversity.) Throughout it all, humans seem to believe that they could control and order their environment. From the Plymouth colony’s laws limiting the placement of river weirs to U.S. Congress considering outlawing otter trawl fishing in the early 20th century, men (women don’t make much appearance in this book) believed that they could control nature. They felt that disasters such as near extinctions might be fixed by farming cod or placing clams under state control. It is admirable to attempt to protect species and biodiversity, yet I ask myself to what extent we are simply elaborating the same belief in our ability to master our environment. 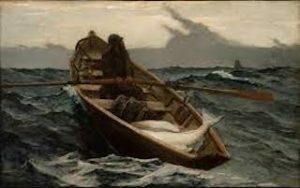 I wonder if modern, popular depictions of fishers repeat the narratives Bolster identifies in Homer’s iconic painting; timeless tradition, man vs. nature (rather than part of it), a bountiful ocean. Today our oceans are in urgent crisis and it is past time to dramatically shift the narrative.